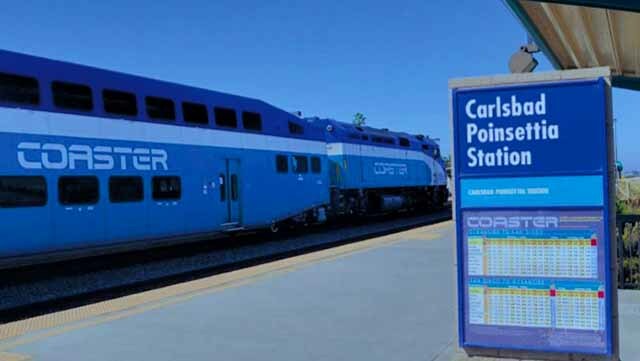 Initial work to improve the Poinsettia train station is under way in Carlsbad. Crews are working between 7 a.m. and 4 p.m. weekdays to clear brush, install construction fencing and complete other preliminary work before a large-scale improvement project begins, according to the San Diego Association of Governments. No service interruptions have been announced. The work will allow for crews to begin improvements at the station later this month, including lengthening and elevating passenger platforms, relocating tracks and replacing existing at-grade street rail crossings with underpasses. Also planned are new shelters, signs and lighting, according to the SANDAG. The project is expected to be finished in 2020. Passengers can expect several weekend service interruptions until that time, SANDAG officials said. The project is part of a slate of improvements along the Los Angeles-San Diego-San Luis Obispo Rail Corridor. The 351-mile passenger rail corridor, known as LOSSAN, is the country’s second-busiest.